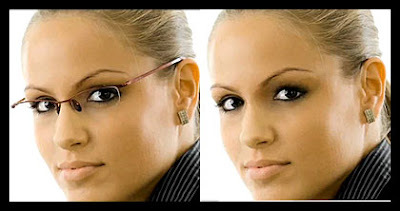 Description: This tutorial is about how to Remove Glasses in Photoshop. This tutorial basically covers Clone Stamp Tool and Healing Brush Tool. Some great tips and tricks for these two Photoshop tools. It also emphasizes on "Eye for Details" which is very essential if you are into post production or pre press industry. You can apply this Remove Glasses in Photoshop tutorial on removing other this as well. wow! looks really good! its so clean. Its like the image has no glasses at all. Can you post a photoshop tutorial that can make an object look wet? can you remove the tint from sunglasses so it just looks like regular glasses? Thanks for the tutorial. The end result looks she never had glasses at all. Wow, this is cool! I'm just a beginner in Photoshop and this lesson is really helpful for amateurs like me. Last year, my dad hired a web designer (Toronto-based) for his business' website. Here in our hometown, Toronto, web design and development is well known for good services. That's why if you'll invest business here, then it would be easier for you to find affordable web development services. Wow very nice, i am looking for Photoshop tutorial right now am happy for that to see your post..interesting, thanks sharing your knowledge to post. Thanks for the video tutorial. Excellent tutorial....very inspiring and true skill using Photoshop. i love the snow background. i'd zoom in to about 200 or 300% and use a clone brush about the size of a pencil eraser (as it appears on the screen at 200-300%) and sample from around the glare. one thing that helps to keep you from destroying the good data is to make the area you want to work on a selection. that way only the glare area is worked on and your corrections dont spill out into the good area. for this, use the lasso tool to select the glare, expand it by 2-3 pixels and put a 2-3 pixel feather on it (so you dont get any harsh edges). Looking smart.Thanks for the video tutorial.